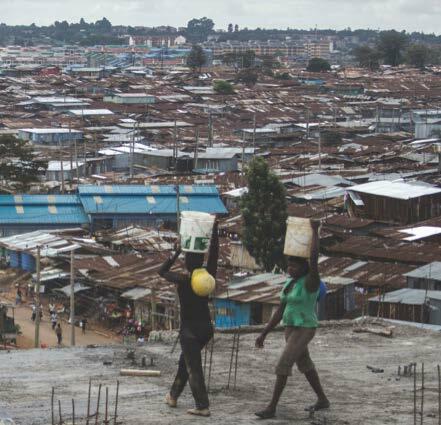 Professor Jason Corburn will describe a ten-year partnership between his UC Berkeley team and the NGO Shack/Slum Dwellers International (SDI) focused on improving the lives and living conditions in the urban slums of East African Cities. This partnership has mapped thousands of formerly invisible slums, literally putting people and their communities on the map and stimulating action. Upgrading projects in urban slums include infrastructure and housing, youth and womens programs, and changes to national policies. The talk will describe an on-gong effort in the Mukuru settlement of Nairobi, Kenya, and a unique improvement project called the Special Planning Area. He will be joined during the talk by Jack Makau, the Director of SDI-Kenya. Prof. Jason Corburn is a Professor in the Department of City and Regional Planning and the School of Public Health at UC Berkeley. He directs the Institute of Urban & Regional Development and Chairs the Urban Studies program at Cal. His research focuses on democratic and participatory science and action to improve urban health. He is leading projects on community-driven solutions for inequities and poor health in Richmond, California, Medellin, Colombia and Nairobi, Kenya. He is the author of five books on urban health, including "Street Science and Slum Health (UC Press 2016), which won the 2017 Highly Commended Book Award from the British Medical Association. Jack Makau, is the Director of Shack/Slum Dwellers International (SDI). SDI works in over 33 countries with the urban poor to secure their right to secure housing, services and well-being. Mr. Makau has worked across Sub-Saharan Africa with local communities as an organizer, researcher, policy advocate and communications specialist.